There are many synonyms for the word said. 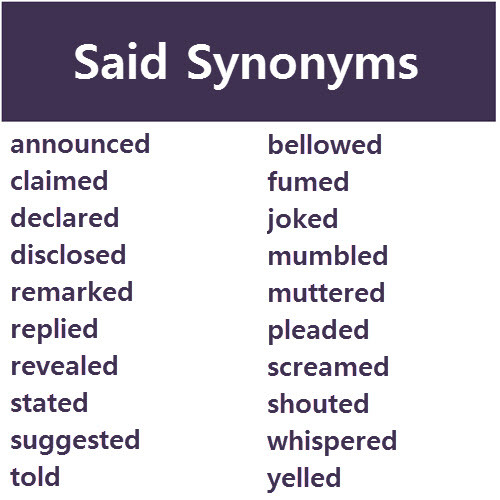 Said and its synonyms can also be described by adding an adverb. Said is the most frequently used word to indicate that a person is speaking in writing. You should heed the warnings below from top writers and instructors that replacing said or using adverbs to describe said is usually a bad idea. Using many said synonyms or alternatives can make your writing stilted and disrupt the flow. Here are three ways you can replace or modify said in a sentence. In these examples we will change the following the sentence: Bob said, "There are no bears in the woods." Use a Synonym: Bob replied, "There are no bears in the woods." or Bob remarked, "There are no bears in the woods." Other synonyms can change the meaning slightly, such as Bob joked, "There are no bears in the woods." Use an Adverb: Bob said softly, "There are no bears in the woods." Or Bob said confidently, "There are no bears in the woods." Remove Said: Don't use said or another verb at all. An easy way to do this by referencing another character's name. For example, "Trust me, Kimberly. There are no bears in the woods." The reader will automatically know it was Bob that said this if it is part of ongoing dialogue between Bob and Kimberly. There are many said synonyms. Some have almost exactly the same meaning while others (like shout and whisper) also convey action. Here is a chart with twenty synonyms, plus links to many more. The verbs on the left are more direct synonyms for said. They include announced, asked, claimed, declared, disclosed, remarked, replied, revealed, stated, suggested and told. The verbs listed on the right are more descriptive of action or emotion: bellowed, fumed, joked, mumbled, muttered, pleaded, screamed, shouted, whispered and yelled. As previously stated, be sure to read the warnings below before adding lots of dialogue verbs and adverbs. Readers know what "said" means and they quickly pass over it when reading your dialogue. The word "said" won't slow them down when they are reading. Using said repeatedly won't bother the reader. Experts argue that if you start getting creative and constantly introduce new dialogue descriptors and said synonyms you will interrupt the rhythm and pacing of your story. Use the dialogue itself to show your characters moods and feelings rather than overusing dialogue tags. Alex Keegan explains in his dialogue article that overusing said synonyms and adverbs can "approach parody." He also shares an example of dialogue that doesn't use said or said alternatives. Stephen Cannell explains that inexperience writers tend to put too many emotional keys under the character when writing dialogue for screenplays. Elmore Leonard says, "...I don't see any reason for using any other verb after a line of dialogue other than 'said.' It's what the person's saying that's important, not what the writer thinks is a good word. And adding an adverb to 'said' is just as bad."